We’ve heard of shocking, sexist dress codes for students. Now parents are being criticized (read: shamed) for wearing pajamas to drop off their kids at school. 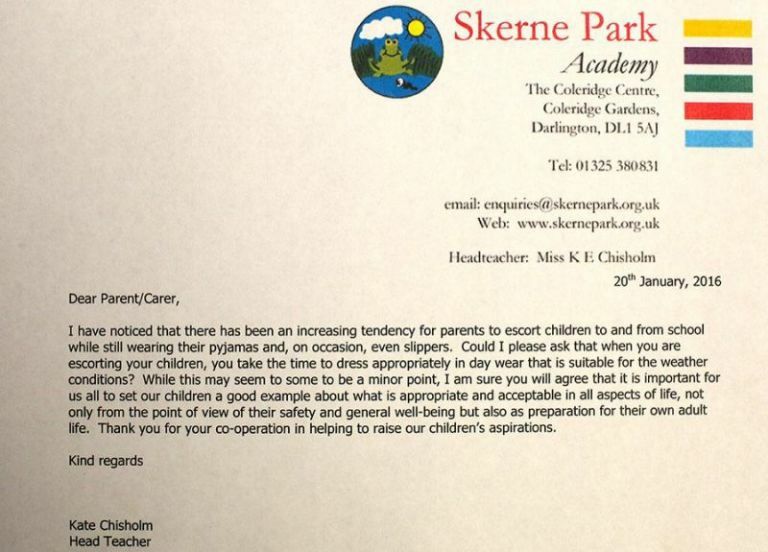 At Skerne Park Academy in Darlington, U.K., Head Teacher Kate Chisholm sent a letter home to parents asking them to “set a better example” for their children when they get dressed in the morning. Despite the initial outrage, Ms. Chisholm said most parents who received the letter support her request. Still, some weren’t having it. This woman wore her pajamas to drop off her daughter at school, claiming she was running late and didn’t feel well. Anyone who has had to deal with the routine chaos of waking up sleepy kids, finding lost shoes, and hand-feeding babies knows that mornings are not the time to tell a mom what she should look like. If I get out the door with a bra on, it’s a good day. Sometimes I don’t even get my first drink of water before 10AM. Hopefully, seeing the sacrifices I make for them every day is enough of an “example” for my kids. Because if anyone comes for my leggings and stained baggy tees, my mom style is going to be the least of their problems. As much as it irritates me to see people walking in public in pajama pants, I feel it is their right to dress like a lazy bum. Those parents OUGHT to be shamed. How is it that people with jobs manage to get dressed in time to leave the house? If the “it’s too hectic to bother wearing clothes” we’re valid, no one in the business sector would have “time” to wear a suit – or trousers from the sound of it! Get the clothes ready the night before. I am a mother of 4 with a full time job. I disagree with the principle. I almost always wear pj type clothing. My children are not going to decide that school isn’t important because I didn’t get dressed to take them. They would on the other hand wonder why it’s more important that mommy “dresses up” than the 100 other things I do each morning. I have even had the audacity to show up to parent teacher conferences wearing soft cotton pj type pants. I have a household, job, kids, dinner, laundry, homework, baths. I am exuberant when I get enough time to bath on a regular basis. Ecstatic when I get a full 8 hours of sleep once a week. I am not giving up sleep to get dressed before I wake up the kids. (I telecommute for work) The principle should worry about the kids. Leave the parents out of it. Excuses excuses. You can find them for anything. I had two babies in diapers, wwas going to the university full time, taking an extra class, and had to go to chapel twice a week. I had a wringer washing machine and no dryer, cooked three good meals a day from scratch, did all my house work and all the yard work too. I was always always working a part time job — I don’t know where to stop – except to say that I was on the Dean’s list and graduated with honors . I did all that and more – the blessing was that it didn’t last forever. I never left the house with or without my children without dressing. And – I usually wore dresses that I ironed and high heels. Come on women….. thou doth protest too much.